Here ye, here ye. The 3rd Annual Ravenwood Ball & Birthday Bash is just around the corner! 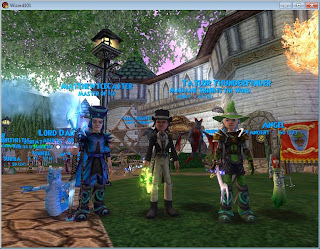 In just 6 days, Wizards from all around the Spiral will join together in Ravenwood for a night of magic and wonders. 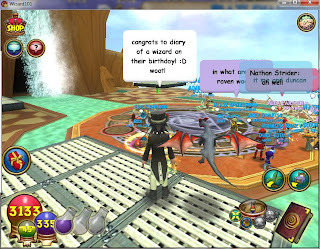 Your host Fallon Shadowblade brings 4 weeks of prizes sponsored by Wizard101 as we embrace the 3rd Annual Ravenwood Ball & Birthday Bash. All the information about the event is right here for you to see so let's get started! Throughout the past 3 years, Fallon Shadowblade has started a tradition of having the annual Ravenwood Ball & Birthday Bash on the same day. This year, the RB&BB is not just celebrating Diary of a Wizards 3rd birthday but also Fallons birthday!!! When Fallon discussed what she wanted for her birthday, this is what she said. As most people prepare for the Ravenwood Ball & Birthday Bash, the biggest challenge they have is to find the right outfit to wear. Have no fear, tons of new outfits have been released since last years RB&BB. You can now combine and pick from hundreds of different robes, hats, shoes, and wands to make your outfit magnificent. Most people love to go with a pet but it is so difficult to choose which. Last year I offered contests while I was hosting one of the many mini-parties to see who could come up with the perfect outfit. I don't believe I found one but I still gave stuff away to the coolest and most exotic outfits. This year, I am not hosting since I just got back into the Spiral but I know that those who are hosting will do a magnificent job. I'm going to try my hardest to go to as many of the parties as possible but before we can do that, we have to wait for the party to begin. If you have ever attended the Ravenwood Ball & Birthday Bash, you will know that you have to wait hours in Ravenwood waiting for the parties to kick in (or just get lucky). 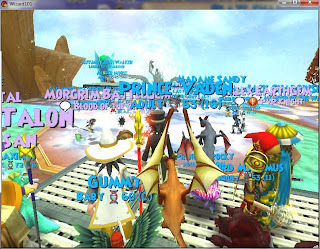 Last year, I logged on Wizard101 at 8:00am and hung out for a few, did the afk dance for many hours and checked back in every so often to enjoy the pre-party. Here's a tip for you if you have never been to the RB&BB before. Funny but true. If you don't get there early, the areas fill up and you are stuck in one of the many realms. Last year I believe RB&BB got up to 18-30 different areas. That's a lot of areas to hold the huge turn out for this event. I hope this helps many of you Wizards (like me) who have other things to do during the day so you can come and join the party whenever you want. Now, I want to recap a little from last year to show you how parts of the RB&BB are. This year, i'm sure the 3rd Annual Ravenwood Ball and Birthday Bash will once again be a huge success and all the Wizards of the Spiral will have a blast! If you don't attend then your basically missing out on one of the biggest and best parties of the year. I am still determining on what to wear. My outfit from last year or try something new. Whatever I choose, I will keep you all posted. I can't wait to see you all at the party! What's the key combo for the so-called "AFK Dance"? I really need to use it sometimes.. The combo is holding down the 'Shift" key and either the right or left arrow keys. Hope this helps! Who cares about that? 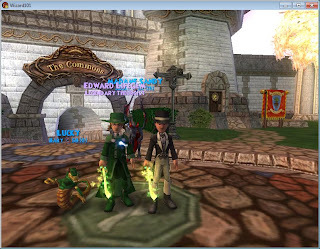 Pirate101 Closed Beta is the big thing.